The Killing lights are a band from California fronted by Vampires Everywhere! frontman Michael Orlando. With the guitarist and bassist doing backing vocals then they're forced to be fairly static, and with Michael Orlando not moving too much it's a fairly static show. By the time they go on stage only a few minutes after the doors open the venue is already busy so they get a large crwod. They do sound good and get a fairly good reaction from the crowd, but for me they fall into the category of "good but not great". Butcher Babies were up next and they proceeded to blow away The Killing Lights as well as throwing down the gauntlet to The Defiled by putting in a seriously impressive performance. Their debut album, Goliath has been out for several months in the US but only gets a UK release later this month. As a result I suspect that many of the audience won't have heard much from them before, but the Butcher Babies didn't take long to win over a load of the Defiled fans. Anyone who made the mistake of making assumptions about how they'd sound based on the fact the band have two young attractive female singers probably got a shock when the show kicked off - these ladies and their bandmates are seriously heavy. 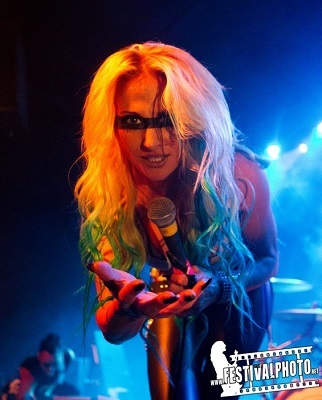 Bands with two female lead singers are very rare and are usually paired with a male singer, so Butcher Babies have that as a unique factor in their sound. The vocal style is mainly classic metal, but with some added screams and more growling style vocals and with both of them singing it's a really effective sound. They certainly went down a storm with the crowd with a moshpit forming and lots of headbanging going on in the crowd. While some bands are fairly static on stage, with Butcher Babies it's the opposite - they rarely stop moving with Heidi and Carla headbanging and windmilling and constantly racing around the stage in a seriously energetic performance. This was my first time seeing them perform live and I was impressed enough to buy the album at the merch stand, and I certainly hope to see them perform live again soon. The Defiled had a tough act to follow, even with the venue being packed with their fans, but they are a great live band so I was expecting good things. As always they put in a great energetic show, with keyboad player AvD being as crazy as ever, climbing on his keyboard, swinging it over his head and generally abusing it (it's held together by huge amounts of duct tape as he does have a habit of smashing it). The band call for fans to crowdsurf to the front to get shots of Jaegermeister (I'm sure the two security guys weren't impressed), and get plenty of fans taking them up on the offer. Part way through the show a hooded figure came on stage carrying a large cross which was then stood up before the cross-beam was then lowered to convert it to an inverted cross. It's not all high energy madness though - for "5 minutes" AvD gives a heartfelt introduction dedicating it to someone special to him before Stich plays acoustic guitar. Well that was the plan - after several minutes trying to get it work (during which AvD entertained the crowd, getting them to sing happy birthday to one fan, kissing one male fan, and doing a great job of keeping things going while the technical problems were addressed). The Killing Lights were good, but were simply outclassed by the other two bands both musically and in the performance stakes. 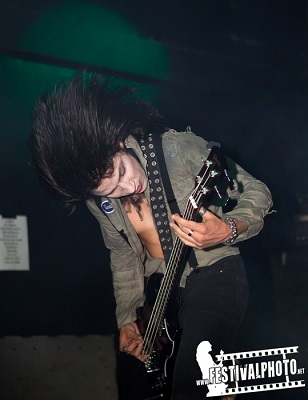 For me the Defiled were great but Butcher Babies stole the show. A great gig.